A warm welcome to our Trushmixer of the week: Phillip Lauer! From his headquarters at Pyramide studios in the heart of Frankfurt, he's been firing out dancefloor rockets for over a decade!! Many people will know him as a member of Arto Mwambe, who have created waves with their releases on labels like Live At Robert Johnson and Brontosaurus, and are widely known for giving one of the best live performances around! If you haven't heard their Live at Robert Johnson CD, make sure to do so – you need this in your life!!! 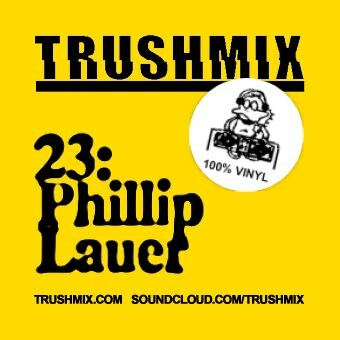 What you also need to hear, is Lauer's forthcoming album on Running Back, and of course: Lauer's Trushmix!!!! An hour long, this is a disco-house infusion that is sure to get your blood pumping!!! heyy guys could we please get a tracklist? ?